Questions were raised after Armenia's prime minister posted photos of himself on an oligarch's plane. Armenia’s prime minister flew to the World Economic Forum in Davos using an oligarch’s private jet, an investigation by the Hetq news site has revealed, sparking discussion on the influence of wealth on Armenian politics. 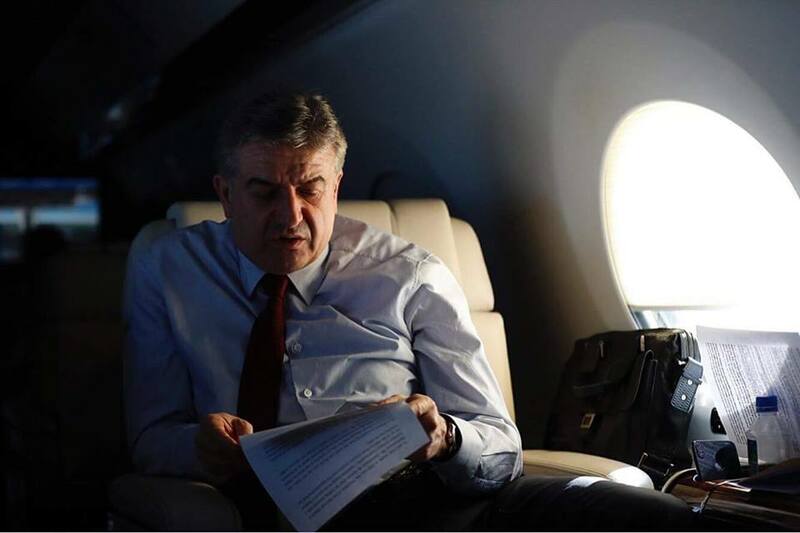 The scandal erupted after Armenia’s prime minister, Karen Karapetyan, posted photos of the luxury plane on Facebook on January 22, sparking outrage among many Armenians. That day, Armenian President Serzh Sargsyan flew to France, while Karapetyan flew to Davos. Traditionally, Armenian prime ministers have mostly used the services of the presidential airplane, an Airbus A319, for their official trips. This time however, the prime minister used a private plane. The photos posted on Karapetyan’s Facebook page reveal the plane to be an American Gulfstream G650 or a Gulfsream G650ER. Both can transport up to 19 passengers and are used by businessmen around the world. Hetq identified the plane as belonging to influential businessman Samvel Karapetyan (no relation), an Armenian-Russian billionaire whose influence has been noticeably increasing in Yerevan. Hetq reported that the prime minister’s delegation arrived back from Switzerland on January 26, landing in Yerevan using the presidential airplane. Unusually, the Zvarots Airport website, which shows regular flights by airline companies as well as flights by private carriers, did not register a flight from Zurich. Foreign Minister Eduard Nalbandian, meanwhile, was photographed traveling a few days earlier in what appeared to be commercial economy class, drawing an unflattering comparison to Karen Karapetyan's luxurious ride. In December 2015, the government announced that government officials were to only travel economy class. “[G]overnment regulations adopted last December require all ministers to fly economy class, which explains Nalbandyan being situated in an aisle seat and makes Karapetyan’s self-indulgence even more egregious,” wrote political analyst and Eurasianet contributor Emil Sanamyan on Twitter.